ST. LOUIS --Five years after establishing its Airport Concession Disadvantaged Business Enterprise (ACDBE) Certification Assistance Program, Enterprise Holdings is reaffirming its commitment to its supplier diversity program. The ACDBE program provides Enterprise Holdings' diverse suppliers with a third-party consultant to assist with the certification process and address any challenges they might face in obtaining an ACDBE certification, including denials and appeals. "We developed this certification assistance program to create value for our existing diverse suppliers, helping these businesses obtain new opportunities and thrive in today's airport industry," said Lee Lewis, Supplier Diversity Manager for Enterprise Holdings. "From a business standpoint it helps drive value, and from a community standpoint it creates opportunity by driving economic inclusion, wealth-building and job growth." Since the program's inception, Enterprise has reached out to more than 15,000 diverse suppliers through quarterly mailings. The company has also hosted several webinars to offer suppliers a forum to ask questions. By continuing to identify, utilize and increase the number of minority-owned, women-owned and other socially or economically disadvantaged small businesses that work to supply goods for its business, Enterprise is driving value in innovative ways. Each U.S. airport is required to demonstrate its efforts toward meeting the federal government's ACDBE goals, and all concessionaires – including Enterprise Rent-A-Car, National Car Rental and Alamo Rent A Car – are thus required to report their efforts to each airport. 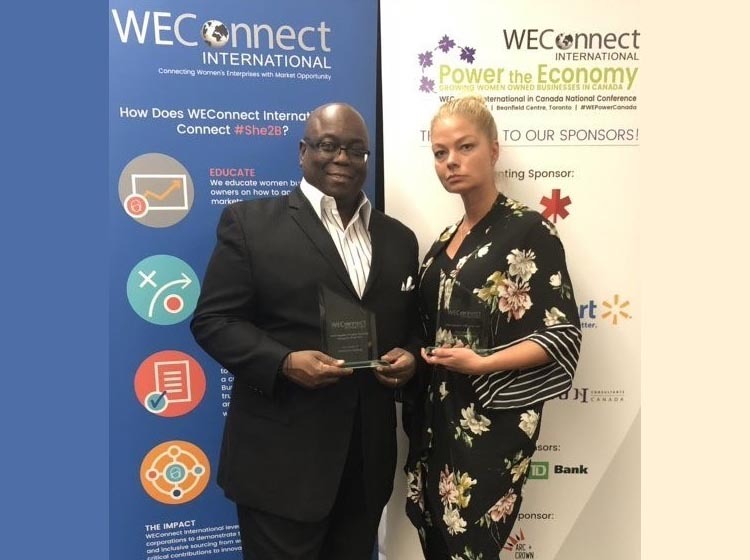 As a representative of Enterprise Holdings, Lewis was recently recognized by WEConnect International as the 2018 Canadian Supplier Diversity Champion of the Year. The award honors Lewis' and Enterprise's commitment to supplier diversity and advancing women-owned businesses in Canada. "This award demonstrates the power, effectiveness and relevance of our supplier diversity program," said Gary Cunningham, Senior Vice President of Enterprise Holdings. "It celebrates not only the partnerships we've established with minority-owned, women-owned, and other socially or economically disadvantaged small businesses, but also the growth we've achieved by working together." In his role, Lewis advocates for businesses like privately owned, Toronto-based Everyday Office Supplies – which is a WEConnect International Certified Women's Business Enterprise. The company supplies more than 50,000 competitively priced, high-quality office products to businesses of all sizes, including Enterprise. "Diverse suppliers bring a unique level of agility, flexibility and innovation," says Lewis. "They're on the cutting edge of new technologies, and they have new ways of doing business that make a big difference for us."